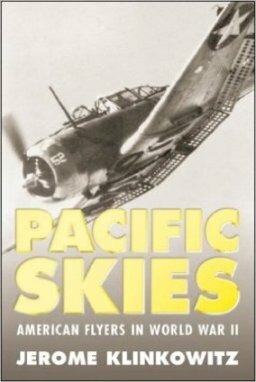 Excerpts from accounts by flyers in the Pacific War make up the bulk of Pacific Skies by Jerome Klinkowitz, Professor of English at the University of Northern Iowa. Although the subtitle indicates that the book will be about American flyers in World War II like Pappy Boyington and Joe Foss, the book also contains many quotations from Japanese pilots who have written books about their battle experiences such as Saburo Sakai in Samurai! and Masatake Okumiya in Zero! Although generally chronological in its approach, the book jumps around quite a bit to different times and places as passages from over 100 books get introduced. By the time the United States had learned the best uses of a carrier strike force, its adversary had lost so many of its own carriers that a new form of aerial attack would be needed: that of the kamikaze, another concept so alien to western thinking that the enemy became even less comprehensible than before. If anything, kamikaze actions convinced Americans that they had been right about their adversaries from the start, just as some Japanese believed the atomic bombings of Hiroshima and Nagasaki showed that their own military leaders, so shrill in their characterization of the United States as a country dead set against the emperor and his people, had been correct. Although moral issues of conventional and atomic bombing get raised in the book, the book Among the Dead Cities: The History and Moral Legacy of the WWII Bombings of Civilians in Germany and Japan (2006) by A. C. Grayling provides a much more thorough examination of ethical issues surrounding the mass bombings carried out by the Allies. Klinkowitz's description of Japan's kamikaze operations contains several errors. For example, he states that nearly half of the kamikaze attacks successfully hit their targets (p. 181). However, Yasunobu (1972, 171), who includes both direct hits and near misses by kamikaze aircraft, computes a much lower success rate of 16.5%. Klinkowitz claims that service in the kamikaze corps was strictly voluntary in the Navy and ostensibly so in the Army, but there are many examples where men were ordered to join a kamikaze squadron. For example, all Zero pilots in the 205th Air Group (over 100 men) were ordered by Commander Tamai in early February 1945 at Taichu Air Base in Formosa to become members of the Kamikaze Special Attack Corps (Hisayama 2009, 230). At Genzan Air Base in Korea during April and May 1945, orders assigning men to special attack squadrons were announced almost every day with no consideration for volunteers (Ozawa 1983, 132). In relating the first kamikaze attack against American forces on October 15, 1944, Klinkowitz writes that "a plane piloted by Rear Admiral Masafumi Arima plunged into the carrier Franklin off Luzon" (pp. 168, 186). The historical reality was that Arima led a group of about 100 planes, and radar of the aircraft carrier Franklin picked up about 20 to 30 of them. Only one plane, with an unknown pilot, got anywhere near the carrier Franklin, and antiaircraft fire shot it down. This plane splashed about 100 feet from ship, but a wing section did end up on the flight deck . Pacific Skies also includes quotations from Yasuo Kuwahara (pp. 185-6, 215-6), who claimed to be a kamikaze pilot with the Army, but his biography titled Kamikaze (1957) has been shown to be fictional (see Ten Historical Discrepancies). The word ohka, a Japanese suicide glider bomb dropped from a Betty bomber, is incorrectly translated as "exploding cherry blossom" (p. 187) rather than "cherry blossom". 1. Inoguchi and Nakajima 1958, 37; Warner and Warner 1982, 84. Hisayama, Shinobu. 2009. Aozora no kōseki: Moto zerosen pairotto ga kataru kūsen to tokkō no kiroku (Flight path in blue sky: Record of air battles and special attacks as told by former Zero fighter pilot). Tokyo: Sankei Shinbun Shuppan. Ozawa, Ikuro. 1983. Tsurai shinjitsu: kyokō no tokkō shinwa (Hard truths: Fictitious special attack myths). Tokyo: Dohsei Publishing Co.
Yasunobu, Takeo. 1972. Kamikaze tokkōtai (Kamikaze special attack corps). Edited by Kengo Tominaga. Tokyo: Akita Shoten.